Fortress Armored transportation is the premier choice for cash in transit companies in Los Angeles, and Southern California. Our clients prefer the power of a national brand with the personal touch and support of a local armored transportation company. That strong, competitive advantage separates Fortress Armored from the ‘big box’ service providers. We provide FLAT RATE BILLING on both our armored transportation services and cash vault processing with our banking partners. This provides our clients the peace of mind of clear pricing without all the billing confusion. 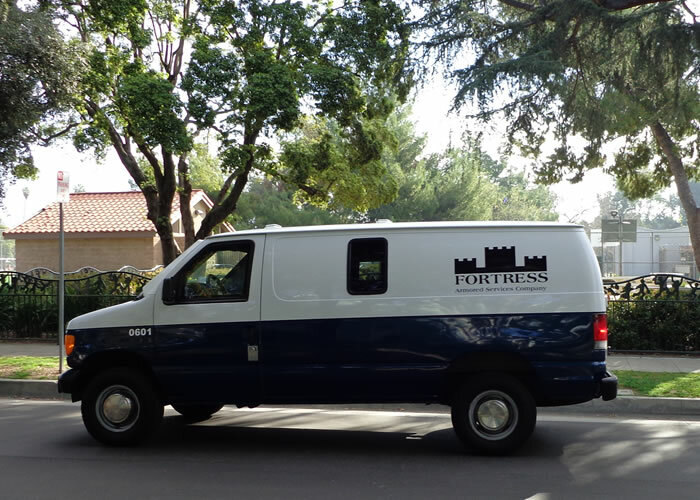 Fortress Armored can offer unrivaled service quality for cash pickups, and/or change order delivery in Los Angeles and surrounding areas. We have established relationships with most major banking facilities in Los Angeles as well as the Federal Reserve. Fortress Armored is also a virtual vault facility for a few financial institutions. We retrieve prepared cash and check deposits from your business and delivers them to the local bank facility you specify for processing and bank credit, and we also deliver any change order that you ordered from your bank. Our guards all go through an extensive background check and are trained to provide the best customer experience possible. Fortress also provides extensive firearms training utilizing simulations in real world scenarios. Counter-Terrorism Training Center (CTTC) is the training provider for Fortress Armored’s firearm program. Our Armored Transportation use a GPS equipped fleet of armored vans to give us a discreet low profile when servicing our customer locations. If you and your team require the local, industry standard armored transportation company in Los Angeles, call today and speak to an armored transportation professional.